Arrived well packaged & looked exactly like picture. Had a minor delivery issue which was corrected the following day. Very helpful staff. Would definitely order again. We added these to a tray of plain chocolate covered Oreos and regular Oreos for dessert at a rehearsal dinner - They made a wonderful, beautiful presentation. We ordered these to put in gift bags for the wedding rehearsal dinner. Everyone loved them. Not only are they really cute, but yum...very tasty too. I hesitated at first because of the price for the number we needed, but I closed my eyes and hit "purchase". Turned out to be well worth the price. Would be great for a shower or the actual wedding too. We selected the mint color and it was very pretty. Arrived in a cooler bag on a very hot day and they were perfect. The Oreos were a great HIT at wedding rehearsal dinner....I only had 2/3 of the order, since 1/3 melted during delivery....company was very nice about making right. Exactly as pictured. Beautiful. Great taste. Everyone fell in love with them. I ordered these cookies for favors at my wedding reception. Everyone LOVED them. We had a bride and groom cookie at each place setting at the wedding shower. They were a delicious, beautiful decoration. Made such a great impact on the wedding tables. Excellent craftmaship and amazing flavor!!! From the moment I saw the wedding bride and groom chocolate oreo cookies I knew they will be the perfect party favor for my daughter's wedding. Not only they are adorable but they taste amazing. They hold up perfectly and the individual wrapping is well done. The customer service was very helpful as to direct me thru the process of when to order and how to handle the cookies once I got them. The only part that needs improvement is the shipping. The boxes that the cookies came in were too soft for the weight and the cooler too. Only one cookie was pretty damaged. I recommend that they improve the packaging boxes. Overall I will order them again. They are beautiful and YUMMY!!! I ordered Mr.& Mrs. OREOS for my bridal shower. I didn't want to hang onto them in case they melt... I was able to place a delivery date a few days prior. They were a big hit and I will definitely order from Beau-coup again! I ordered these to place in the guests hotel bags for my son's wedding. I wanted something chocolate to put in the bags and came across these. They went perfectly with the theme and color scheme. Everyone loved them and they are delicious. They also came in a very timely manner. I purchased these to serve as a favor for the gap time period between church and reception. Everyone loved them. I also made sure I had enough for the bridal party to get a pair as well as the parents of the bride and groom and the happy couple. I ordered these not expecting them to be so good. They are exactly how they look in the photo and arrived on time and in perfect condition. Big hit at the bridal shower!!! Purchased the bride chocolate covered Oreos as 1 of the bridal shower favors for my cousins shower and they were a big hit with all of the ladies! Not only were they adorable but the taste & quality of chocolate used was delicious! Definitely glad I made this purchase! If you're contemplating on making this purchase do so you won't be disappointed!! I bought these cookies for my Son's Wedding. They look and taste amazing. What a beautiful job they did. Everything arrived on time and safe.Looking forward to doing business with them again and again. These cookies were a huge hit at the bridal shower for my daughter in law. I got so many compliments on them. They tasted great and kept very well. The only draw back was the shipping costs that were quite expensive . This was a gift for the Bridal Party at their Bachelor-Bachelorette party. They each received a set and it was the perfect dessert. This favor couldn't have been better! These cookies were a perfect table favor at our Rehearsal Dinner. We put them in front of the Place Card. They were very pretty and tasted as good as they looked. I'm glad I found them! Taste as good as they look! We used these to place next to each table setting for our engagement party. Guest absolutely loved these little treats! They taste as good as they looked and they were a huge hit. I would definitely order them again. I put a set at each place sitting for my son's wedding rehearsal. They made such a hit. They were delicious. I'm happy I ordered extras to bring home for my son and his future wife. These were a big hit at my daughters bridal shower. Ordered these for my son and daughter-in-laws wedding party. Ordering was simple, received on time, and the quality can't be beat. Cookie was fresh and the chocolate used was smooth and creamy. I bought these cookies as wedding favours and couldn't be happier! They look really great (ok, so you can see the oreo through the chocolate on the sides of some of them, but they still look AMAZING!). Customer service at Beau-Coup was great. Shipping was fast and even in this heat wave, the cookies were perfectly intact (no melting). They were super well-packed with ice packs and lots of Styrofoam. I will be keeping them in the fridge for one week until my wedding. For Canadian customers, you should know that I had no problem having this order delivered to Montreal mid-July. Shipping took 2 days (even though the estimated delivery time on check out gave me a huge window of 10 days for delivery, which had really freaked me out). Also, as soon as I placed my order, Customer Service called to tell me that it could be risky shipping to Canada because of border delays and cookie freshness. Again, I went with my gut and it paid off! (perhaps I was better positioned being in a large city with great UPS service). I should mention that duties were extremely high -- perhaps because a food item? I bought 70 sets (ie 140 cookies) and duty was $105. Since that is about 1/3 of what the order was worth, I thought it was worth mentioning. I am so pleased I purchased these as my wedding favours and I cannot wait to display them next week!! I purchased these as favors for a bridal shower. They were great. Cute and they tasted good! You have to use 2-day shipping (which should show up automatically when you check out, but does not) so they were very fresh. They melt easily so probably not a great choice for outdoor events in the summer. Great product. I would get them again. This cookie is so special and tasty. It made a big impact on the cookie trays at my son's wedding. 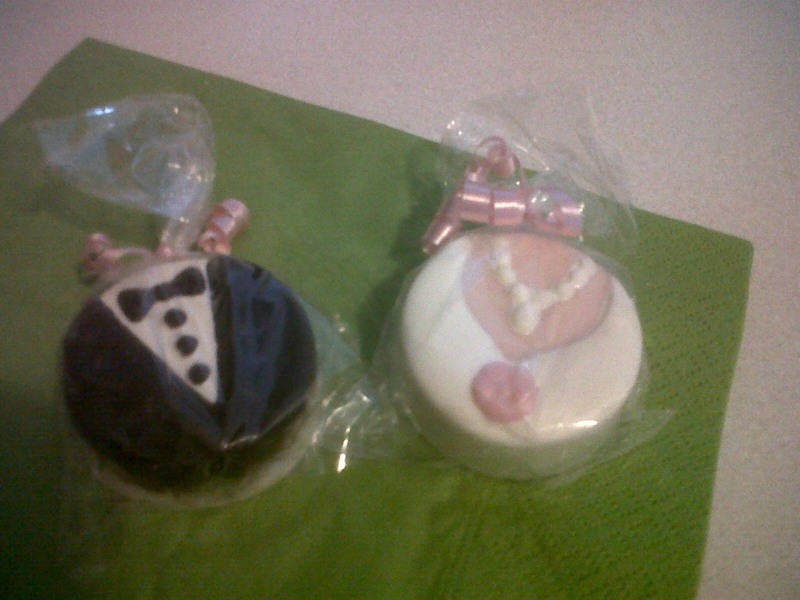 Bought these bride and groom cookies for the rehearsal dinner for my son's wedding and they were such a hit! I placed them in front of each place setting.....they not only looked adorable, but also tasted delicious!! I wouldn't hesitate to recommend -- you won't be disappointed!!! These were terrific! They arrived on time having been baked the day before, they were really cute - a big hit at the shower - and best of all, they tasted GREAT!! these are too cute to eat!! Q:Can you get the groom and groom pair? A:Yes, select groom only! It will give you 12 groom oreos - where as bride and groom gives you 6 of each. Q:Hi there, if I have 150 guests, what do I put as the quantity to order? Also, do you ship to London? A:If you would like to order the set, input 75 sets of 2 (equaling 150). If you would like to order just the bride or groom, input 150 pieces. Please view International Order FAQ to learn out our international shipping: our http://www.beau-coup.com/international-orders.htm . Q:The cooler fee has an automatic NO answer in the order sheet. I want to order these in July, can and should I have a cooler option to avoid melting? I see reviews noting concerns about melting. What is the shelf life of the chocolate covered oreos? I could order them now to avoid extreme temperature of summer and store them in my home until August wedding. Your guidance is appreciated. A:You can place an order now and input your "desired delivery date" if that is easier for you-- item will be processed and shipped in accordance with your desired event date! The cooler fee applies to the warmer months, and is now required for all oreos. The shelf life is approx. 3 months for chocolate covered oreos. Q:I recently placed an order how can I verify that it was received? A:Unfortunately, these cookies are not kosher. However, there are several other kosher options on our site. Q:Do these need to be refrigerated once delivered? A:They can be kept at room temperate in a cool environment. If it's warm, we do recommend refrigerating them and taking them out the day prior to use. Q:will icing stay on the cookie i if put them in a bakery bag without the celephane/plastic wrapper? A:We recommend leaving it in the wrapper to be safe. Q:Can I chose a ribbon color other than black for the groom cookie (like for a wedding with a color theme)? Or even white ribbon? A:Yes, we can definitely change the ribbon for the groom cookies. Please contact our customer service department at 877-988-2328 for assistance. Q:Are these cookies peanut free? A:These Oreo cookies do not have nuts added. However, the facility does process peanuts and tree nuts. Q:Do you offer a volume pricing for ordering more than 100 sets? A:This item does not have a volume discount based on quantity. Q:Are the bride and groom cookies packaged separately? A:If you order the bride and groom couple set, they would be packaged together. Otherwise, you can order just the bride or just the groom design. Q:Do you use real Oreo cookies or Oreo-like cookies? A:These are brand-name Oreo cookies. Q:How quickly do these cookies need to be consumed after purchase? Will they last 2 weeks from arrival, 1 month? A:The shelf life of this item is 2 months. $15 Rush Fee no rush servicerush service 1-2 days processing time. Special note: Oreo cookies sometimes show through the coated chocolate design and will not always be perfectly coated. Some colors may run a bit due to the cookie color molding process. 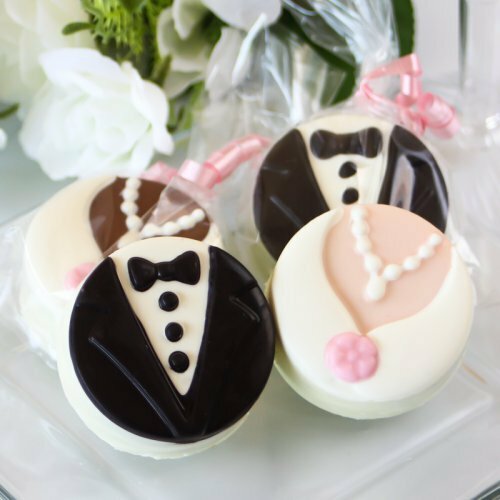 Celebrate the happy couple with these bride and groom chocolate covered Oreo cookies. 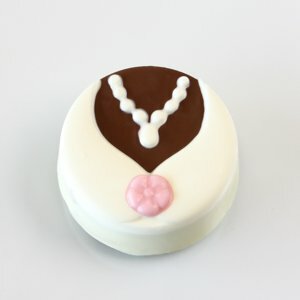 Each Oreo cookie is coated in a chocolate design to resemble a bride and groom. Available as bride-only gown design, groom-only tuxedo design, or as bride and groom couple set. Cookies are individually-packaged in clear bag. Groom design includes matching black ribbon. 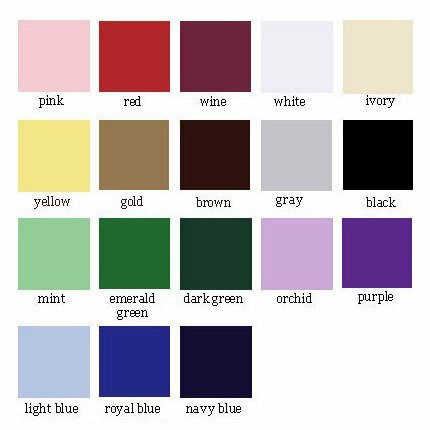 Bride design is available in two skin tones, and the flower color option of your choice; ribbon color will match the flower color you choose. These make great bridal shower, wedding reception, and engagement party favors. 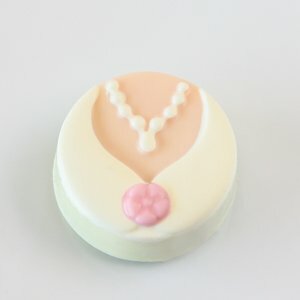 For more bride and groom themed products, check out our tuxedo and gown favor boxes and Mr. and Mrs. ceramic salt and pepper shakers. Please note that this item can only be shipped via 1-Day Shipping for delivery dates between May 1st and September 30th, and 2-Day Shipping the rest of the year. Please note Tuesday deliveries will only be accepted with 1-Day Shipping service. Please select the $7.50 cooler fee for all orders being delivered between May and September.